It was six o'clock in the morning of last Thursday (Christmas morning), when Nathan Stoddard, a young saddler, strode through the vacant streets of one of our New England towns, hastening to begin his work. The town is an old-fashioned one, and although the observance of the ancient church festival is no longer frowned upon, as in years past, yet it has been little regarded, especially in the church of which Nathan is a member. As the saddler mounted the steps of his shop, he felt the blood so rush along his limbs, and tingle in his fingers, that he could not forbear standing without the door for a moment, as if to enjoy the triumph of the warmth within him over the cold morning air. The little stone church which Nathan attends stands in the same square with his shop, and nearly opposite. It was closed, as usual on Christmas day, and a recent snow had heaped the steps and roof, and loaded the windows. Nathan thought that it looked uncommonly beautiful in the softening twilight of the morning. While Nathan stood musing, with his eyes fixed upon the church, he became suddenly conscious that another figure had entered the square upon the opposite side, and was walking hastily along. He turned his eyes upon it, and was greatly surprised by its appearance. He saw a tall old man, although a good deal stooping, with long, straight, and very white hair falling over his shoulders, which was the more conspicuous from the black velvet cap, as it appeared, that he wore, and the close-fitting suit of pure black in which he was dressed, and which seemed to Nathan almost to glisten and flash as the old man tripped along. 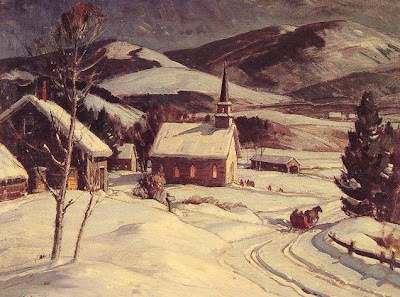 He had hardly begun to speculate as to who the stranger could be, when he beheld him turn in between the posts by the path that leads to the church, tread lightly over the snow, and up the steps, and knock hastily and vigorously at the church-door. But half recovered from his wonder, he was just raising his voice to utter a remonstrance, when, to his sevenfold amazement, the door was opened to the knock, and the old man disappeared within. It was not without a creeping feeling of awe, mingled with his astonishment, that Nathan gazed upon the door through which this silent figure had vanished. But he was not easily to be daunted. He did not care to follow the steps of the stranger into the church; but he remembered a shed so placed against the building, near the farther end, that he had often, when a child, at some peril indeed, climbed upon its top, and looked into the church through a little window at one side of the pulpit. For this he started; but he did not fail to run across the square and leap over the church-gate at the top of his speed, in order to gather warmth and courage for the attempt. When Nathan Stoddard climbed upon the old shed and pressed his face against the glass of the little church-window, he had at first only a confused impression of many lamps and many figures in all parts of the church. But as his vision grew more clear, he beheld a sight which could not amaze him less than the apparition that startled Tam o' Shanter as he glared through the darkness into the old Kirk of Alloway. The great chandelier of the church was partly lighted, and there were, besides, many candles and lanterns burning in different parts of the room, and casting their light upon a large party of young men and women, who were dressed in breeches and ruffled shirts, and hooped petticoats and towering head-dresses, such as he had only seen in old pictures. They were mounted upon benches and ladders, and boards laid along the tops of the pews, and were apparently just completing the decoration of the church, which was already dressed with green, with little trees in the corners, and with green letters upon the walls, and great wreaths about the pillars. The whole party appeared full of life and cheerfulness, while the old man whom Nathan had seen enter stood near the door, looking quietly on, with a little girl holding his hand. It was not until Nathan Stoddard had looked for some little time upon this spectacle that he began to feel that he was witness of any thing more than natural. The whole party had so home-like an air, and appeared so engaged with their pleasant occupation, that, notwithstanding their quaint dress, Nathan only thought how much he should like to share their company. But the more he studied their faces, the more he was filled, for all their appearance of youth and their simple manners, with a strange sort of veneration. The sweet and cheerful faces of the young women seemed to grow awfully calm and beautiful as they brought their task to a close, and their foreheads, with the hair brought back in the old-fashioned way, to become more and more serene and high. There was a strange beauty, too, about the old man's face. He appeared to Nathan as if he felt that the group before him only waited his command to fade away in the morning light that struggled among the candles, but he could not bear to give the word; and so they kept playing with the festoons, and stepping about the pews to please him. Nathan felt a cold thrill, partly from pleasure, and partly from awe, running up his back, and a strong pain across his forehead, seldom known to one of his temperament. Again and again he drew his hand across his brows, until he felt that he was near swooning, and like to fall; and he clung desperately to his hold. When the fit was over, he dared venture no more, but hastened to the ground. It was no fear of ridicule or of incredulity that led Nathan Stoddard to keep secret what he had witnessed. But it was like some deep and holy experience that would lose its charm if it were spoken of to another. So he went back to his shop, and sat looking upon the church, and watching, almost with dread, the doves that lighted upon its roof, and fluttered about, and beat their wings against its windows. The minister of Nathan's parish was a young man by the name of Dudley; and it so happened that he had driven out, before light, on the morning we have spoken of, to visit a sick man at some distance. In returning home, he had to pass along the rather unfrequented street which runs in the rear of his church, and close to it. As he was driving rapidly along, his ear caught what seemed the peal of an organ. He stopped his horse to listen, and a moment convinced him that the sound both of the instrument and of singing voices came from his own church; and it was music of a depth and beauty such as he had never before heard within it. Filled with astonishment, he put his horse upon its fastest trot, and drove round into the square, to the shop of Nathan Stoddard. "There is music to-day in our church, Nathan!" he cried to the young saddler. "What can it mean?" But Nathan answered not a word. He caught the horse by the head, and fastened him to a post before the door. Then stepping to the side of the sleigh, he said to Mr. Dudley, "Come with me, Sir." Mr. Dudley looked upon the pale face and trembling lips of his parishioner, and followed in silence. "Thou mak'st my cup of joy run o'er." And he was so rapt with the sights and the sounds within, that it needed all Nathan's endeavors to uphold him. By this time the sound of a gathering crowd below, which he had not heeded at first, was forced more and more upon his notice; and the anxious voice of his oldest deacon calling, "Mr. Dudley! Mr. Dudley!" rose high and loud; while a great thundering at the front door of the church announced that the people below had also caught the sound of the music, and were clamorous for admission. Mr. Dudley hastened round to prevent their causing any disturbance to the congregation within; but he came only in time to see the door burst open, and to be borne in with the crowd. All gazed about in wonder. The congregation, indeed, were gone, and the preacher, and the choir; and the room was cold. But there was a great green cross over the pulpit, and words along the walls, and festoons upon the galleries, and great wreaths, like vast green serpents, coiled about the cold pillars. The church of the Orthodox parish of —— had been fairly dressed for Christmas by spirit hands. When Mr. Dudley reached his home, after the wonder had in part spent itself, he found that an enormous Christmas pie had been left at his door by a white-haired old man dressed in black, about six in the morning, just after he had gone to visit his sick parishioner. The girl who received it reported the old man as saying, in a tremulous, but very kind voice, "Give your master the Christmas blessing of an old Puritan minister." How the meaning of this message would have been known to Mr. Dudley, had not the events we have told disclosed it, who can say? Need I add, that my friend, Mr. Dudley, from whose lips I have taken down the above narrative, has directed the decorations to remain in his church during the coming month, and that he avows the intention of observing the Christmas of the following year with public services, unless, indeed, he should be anticipated by his ancient predecessor. It may not be impertinent to observe, that I am invited to dine and spend the day with the Dudleys on that occasion, and I shall not fail to make an accurate report of whatever glimpse I may obtain into the mysterious ceremonies of a Puritan Christmas. THank you for sharing this, Margaretha. All these stories are rather long, but I figured that some of you would be intersted in reading them. A CHRISTMAS DREAM, AND HOW IT CAME TRUE.